The VMware Certified Associate exam and certification is often the first step into launching a successful IT career with a specialization in virtualization. Since candidates for this certification are often less experienced, it’s more important to ensure they are thoroughly prepared so that they can succeed on their exam and advance on their career path. 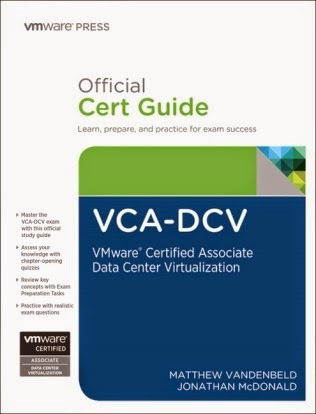 The Official VCA-DCV Certification Guide focuses specifically on the objectives for one of the most common Associate-level certifications: the VCA-DCV certification, which specializes in virtual datacenter design, troubleshooting, and deployment. Covering all the objectives and knowledge needed for the VCAD510 exam, experts Matt Vandenbeld and Jonathan MacDonald share preparation hints and test-taking tips, helping IT professionals identify areas of weakness and to improve both conceptual knowledge and hands-on skills.